Employee onboarding is incredibly important, but hard to get right. You spend all of this time, energy and money on hiring an employee only to leave them high and dry when they start work. You know that if you can successfully onboard a new employee with a structured plan, they’ll be more productive, more likely to stay at your company, and more engaged. But for some reason, you often get onboarding wrong. Your intentions are good, and while you’d love to spend a dedicated three months making sure a new employee is onboarded properly, you just don’t have the time. You needed someone up and running yesterday. So, your onboarding process ends up lasting for about a week, if you’re lucky. You promise you’ll do better next time, but you never make it a priority. Onboarding is your one shot to integrate an employee properly into your culture. It’s a way to ensure that they’re successful long term, and have all of the resources they need to be an effective, autonomous, productive employee. We put together a complete guide to teach you everything you need to know about onboarding new employees, so you can be sure that each new hire is successful. In our research report, the State of Employee Engagement, we found that onboarding was a major problem at many companies all over the world. The report updates in real-time, but as of December 2016, when we ask employees “Does your organization have a great hiring and onboarding process?” we find that a massive 51% of people think their company’s process could be improved. This is a huge opportunity for organizations to increase employee engagement. Here are a few more powerful statistics that really explain how crucial it is. 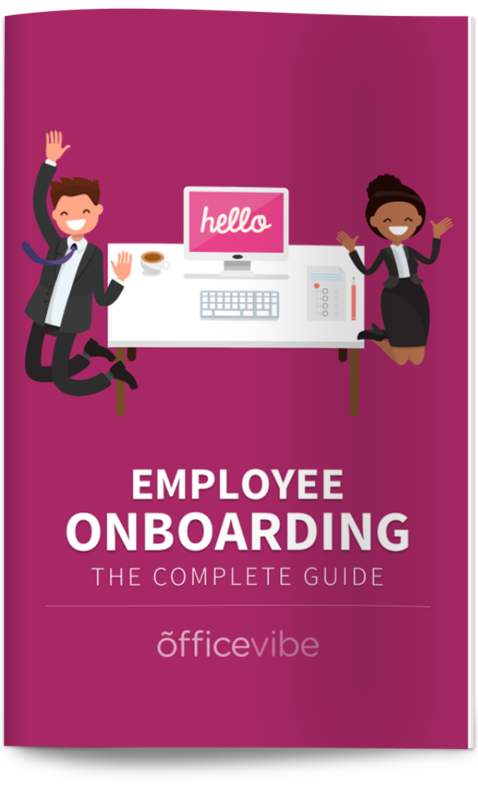 This infographic was crafted with love by Officevibe, the leader in employee engagement software that helps you learn aboutemployee onboarding. Onboarding is the most important part of the employee lifecycle. You only get one chance to make a first impression, so you’ll want to make sure your onboarding is done right. The more confusion there is in the process, the more likely an employee is to take longer to ramp up, have the wrong impression of the company, or even worse, quit. Here are a few of the biggest mistakes that are commonly made with the onboarding process that you’ll want to avoid. The key thing you want to avoid for any employee, especially at the beginning, is confusion. If an employee is confused, they’ll spend unnecessary time and energy wondering and worrying about what they’re doing. Also, at the beginning, all an employee wants to do is impress their new boss. It’s tough to know if you’re impressing them if you don’t know exactly what’s expected of you. How to fix this: The fix for this is simple. Make sure employees are 100% clear from the beginning what their goals and expectations are. Using something like OKRs to set goals is a great way to create that clarity. This is probably the most common mistake made with employee onboarding. I understand why this happens, but you’re doing a huge disservice to your employees by not giving them enough time. The problem is, managers want their new employees to be up and running as quickly as possible, so they don’t invest the right amount of time in developing them. But remember, short term pain, long term gain. How to fix this: This is easier said than done, but what you need to do is be patient with your employees. Understand that it’s going to take some time to develop them. Be ready to invest time and money so that they’ll be way more productive long term. Onboarding is what sets you up for long term success in a company, meaning that it’s so important you take it seriously. Having a process will make scaling and improving easier for you, and you’ll be able to find problems in the process faster. How to fix this: Work with multiple members of your team to create a formal process that everyone can agree on. You can have different owners for each step of the process. While having a process is important, it’s also important to make sure each employee is coached and trained the way they want to be. Each employee is unique, and so you might want to adjust your process depending on their preference. Some employees will require more feedback, and others will want to learn about their role in a different way, so it’s a good idea for you to adjust. Try to personalize the onboarding process as much as possible. How to fix this: Don’t get into the mindset of following the process word for word. It’s okay to use it as a guide, but then adjust accordingly. Be mindful of what your new employees would want to make them the most successful. If you don’t collect feedback about your onboarding process, how will you know if it’s any good? Many managers make the mistake of assuming that it’s their job to get an employee up to speed quickly, train them how they’ve done things, and move on. But if you do that, then what was the point of hiring someone in the first place? You want to make sure that employees are actually getting value out of the program so that when new employees join, their experience will be even better. How to fix this: Collect frequent feedback from new employees about how their onboarding is going. At the beginning, feel free to check in every day (you want to check in more often at the beginning). Then, I would check in at the end of week one, week two, month one, month two, and month three as a minimum. A new employee should already have had some interaction with your company before their first day. While you don’t want them to feel overwhelmed or like they have work to do before they even start, sending them helpful guides, company history information or links that might help them is a great idea. You could send them a friendly email letting them know how excited you are for them to join, you could send them a “welcome package”, or even simply let them know what to bring on the first day to help ease them in. How to fix this: The key here is to remove any of that fear or nervousness that a new employee likely has. Get creative, but remember to show them how excited you are for them to join, send them helpful links, and make sure they know what to expect when they arrive. Sourcing and hiring someone is an incredibly difficult task. Once that’s done, and you’ve found someone who you think is right for the job, you need to make sure their first few months at the company are amazing. You don’t want them to quit after all you went through to get them on the team, so follow these tips to ensure a successful employee onboarding. This is by far and away the most important tip for employee onboarding. The process takes a minimum of three months to complete, but most companies don’t give their employees more than a week. They want their new hires to be up and running as quickly as possible, but you don’t want a half-baked employee working on the team. There is so much that a new employee needs to understand. The ins and outs of your company, its culture, your product/service, how the team works, the voice and tone, the tools to use, etc. More than anything, you need to understand that it takes time, so you have to be patient. The longer someone has to get up to speed, the faster they will reach full productivity. While you need to take your time and exercise patience with new employees, one way to get them up to speed faster is by establishing clear goals for their first three months and checking in on them frequently. This helps them focus on the right things and gives them a target to aim for. The worst thing you can do is have a new employee just sitting there twiddling their thumbs, so setting goals early on is a good way to keep them working on what’s important. It’s also a great way to ensure that you’re both on the same page and that there’s no confusion. One of the biggest concerns for any new employee is if they’re doing what you want, so setting goals helps makes sure this happens. Remember to check in on the goals frequently. Ideally, at least every two weeks. Mentorship programs are great for any employee, at any stage in their lifecycle, but during onboarding they’re even more effective. When first starting out, employees might be nervous, confused, and overwhelmed. Providing them with a mentor is the perfect way to ensure they have someone to help them through this intimidating process. Asking questions can be tough for anyone, but for a nervous new employee, it’s good to know they have someone they can go to directly. Plus, it lets the mentor focus exclusively on onboarding that new employee, making the process even smoother. With multiple people, it wouldn’t be easy to pinpoint where the issues in the onboarding process are. You only get one chance at a first impression, so you want a new employee to have an amazing experience joining your company and the team. Ideally, you’ve had contact with them before they even start, but you want to make sure that when they first arrive, they start off on the right foot. You need to understand how nervous and how shy they’ll be. Make sure that everything they need for work is set up on day one (you’d be surprised how often this is forgotten about). The secret to getting this right is to be mindful. Think about the new employee and take care of them. Remember, there’s no such thing as too much communication. At the beginning of the onboarding process, it’s incredibly important to check in often to see how things are going. This is the exact process I would use to make sure you’re checking in often enough. Check in every single day the first week (10-15 minutes each day). Hold an end of week review at the end of week one. Recap the week, and then plan the following week. Repeat this process each week for the first month. Recap at the end of month three, but still check in every now and then. 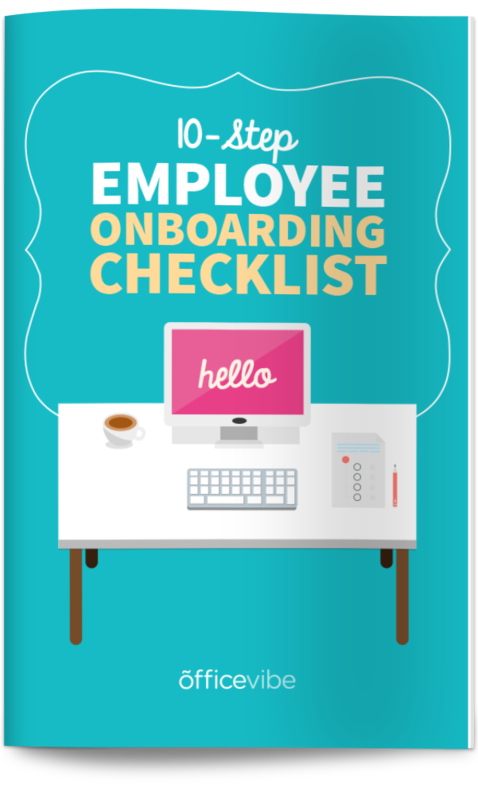 Free Bonus: Download the exact employee onboarding checklist we use at Officevibe with our new employees. Let’s learn from the best. Companies like Facebook, Google and Twitter are well-known for their culture, and have successfully onboarded thousands of employees. As a source of inspiration, here are examples of the onboarding process at some of the most notable companies in the world. Twitter’s onboarding starts before you even walk in the door. This is an important lesson for companies: don’t start your onboarding on an employee’s first day, start it as soon as they accept the offer. They have a program called “Yes To Desk” which outlines everything that needs to be done from the time an employee says yes to when they arrive at their desk. Things like making sure their computer, emails, and any tools they’ll need are set up, their desk is filled with swag like t-shirts, and there’s something celebrating their arrival, like a bottle of wine. They’re always improving, talking to people every one or three months to see what, if anything, should be changed. “By centralizing the mentoring and onboarding responsibilities, we’ve greatly decreased the costs hiring has on the rest of the organization in terms of time spent showing people the ropes and keeping our standards consistent”. IBM’s onboarding program, Succeeding@IBM, is known as one of the best onboarding processes of any company. What makes it so exemplary is that it lasts for two years. At most companies, you’re lucky if onboarding lasts more than two weeks. IBM’s two-year rollout ensures that their employees have enough time to learn everything they need to know, slowly and comfortably. The onboarding process comes with a ton of technology to make things simpler for the employee, like internal social networks to meet coworkers, career plans, mentoring, and training. One of the coolest things they do in their onboarding program is something called “Lunch Roulette”, where a software application randomly selects two groups of four people (no more than one person per department) to go to lunch on the company’s tab. All Zappos employees go through a four week training program similar to Facebook’s bootcamp. And of course, they famously offer new hires $4,000 to quit in order to make sure that employees are joining the team because they want to be there, not for the money. Start your onboarding before an employee’s first day. Do whatever you can to make them feel comfortable. Be patient, and give employees more than enough time to ramp up. Getting feedback on the onboarding process is the only way to know if employees are actually benefitting from it. You can have the slickest process and the most robust training program, but if employees don’t find it useful, then you’re just wasting time and money. You always want to be getting better, and you should empower each new employee to help you improve for when new ones come on board. Ideally, very often at the beginning (every day during their first week), then check in at the end of week one, week two, etc. Using onboarding surveys is a great way to get consistent feedback on the process and organize it in an easy way. If there was one thing you would change about the way your onboarding is going, what would it be? Is the onboarding too overwhelming for you? What can I do to make your onboarding more successful? Have you met some of the coworkers? If so, were they nice to you? Did we make you feel welcome on your first day? So far, is the job what you expected it to be? So far, what part of the onboarding process has been the most effective/beneficial? Many organizations miss out on an incredible opportunity by not collecting feedback during this crucial moment. It’s possible that during those first few days they’re questioning their decision of having joined your organization. It’s during that vulnerable moment when they need reassurance more than ever. When an employee first joins the organization, they’re nervous, so it’s up to you to calm those fears. You want to make it as smooth and comfortable for the employee as possible, to ensure that they grasp everything. They also have a fresh set of eyes, so they’re perfect for telling you what’s wrong with the process. A smart idea that I once heard from HubSpot, a company that’s well-known for their amazing culture, is that they make each new employee responsible for improving the onboarding process for the next employee that joins. There’s a lot to remember to make sure you have a good onboarding process set up, so I’ve prepared a template that you can use to make your life easier. I tried to keep it as simple as possible. There are many things that you should keep in mind with onboarding, but here are 9 crucial points that will make your new employee onboarding a breeze.